the fount of all holiness. the Body and Blood of our Lord, Jesus Christ." This prayer in the Mass uses dewfall as an image of the Holy Spirit. Why is the Holy Spirit like dewfall? The quiet early hours of the morning are a time when God shows us how the Holy Spirit works in our lives. 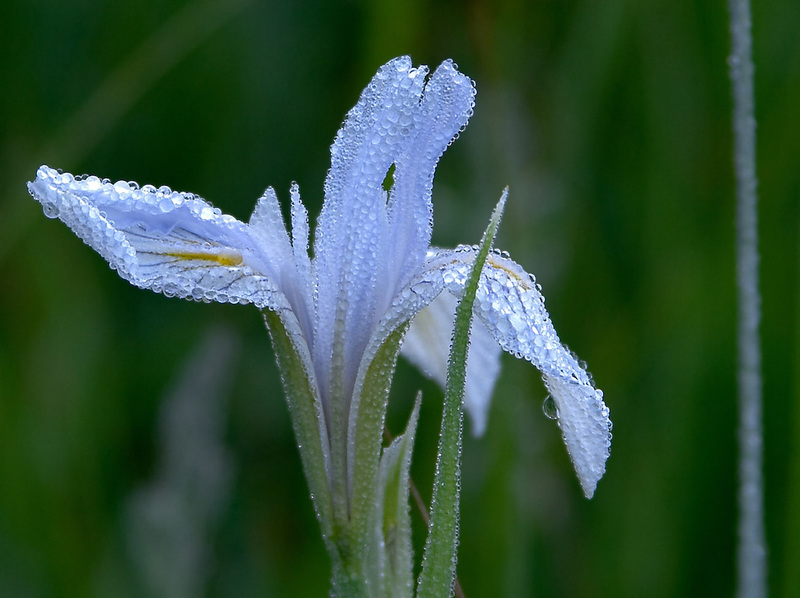 In those hours, the dew covers the ground and soaks it. Water comes to the ground in various ways, such as rainfall and snowfall which are easily seen, and also dewfall, which is when water covers the ground in the form of dew. Dewfall is a quiet process: it forms silently and gradually. There is a something mysterious about dew. You can be outside in the evening when the ground is dry, but go outside in the morning and find it is wet. Unlike rainfall, you do not hear dewfall. You may ask yourself, "Did it rain last night again?" But it was not rainfall; it was dewfall. God used dew to reveal His love to the Jewish people when they left slavery in Egypt and journeyed through the desert to the Promised Land. He showed His love by sending dew every morning, and after it evaporated, the people found bread called “manna” which nourished them. In the morning there was a layer of dew all about the camp, and when the layer of dew evaporated, fine flakes were on the surface of the wilderness, fine flakes like hoarfrost on the ground. On seeing it, the Israelites asked one another, “What is this?” for they did not know what it was. 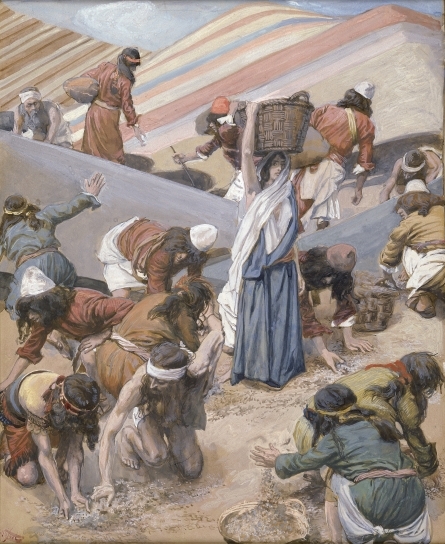 But Moses told them, “It is the bread which the LORD has given you to eat (Exodus 16:13-15). You are indeed Holy, O Lord, the fount of all holiness. Make holy, therefore, these gifts, we pray, by sending down your Spirit upon them like the dewfall, so that they may become for us the Body and Blood of our Lord Jesus Christ. We know the Eucharist completes the meaning of the manna in the desert because Jesus said, “I am the bread of life. Your ancestors ate the manna in the desert, but they died; this is the bread that comes down from heaven so that one may eat it and not die. I am the living bread that came down from heaven; whoever eats this bread will live forever; and the bread that I will give is my flesh for the life of the world” (John 6:48-51). Jesus clearly shows that the manna points to the Bread of Life that He would give, saying “For my flesh is true food, and my blood is true drink.” (John 6:55). He finally revealed what He meant when He established the Eucharist at the Last Supper: “Jesus took bread, said the blessing, broke it, and giving it to his disciples said, 'Take and eat; this is my body.' Then he took a cup, gave thanks, and gave it to them, saying, 'Drink from it, all of you, for this is my blood of the covenant, which will be shed on behalf of many for the forgiveness of sins'" (Matthew 26:26-28). In the desert, God sent the dew first, and then the manna. At Mass, God sends the Holy Spirit, and then the bread and wine become Christ’s Body and Blood. A miracle happens, and Jesus is with us, hidden under the form of bread and wine. 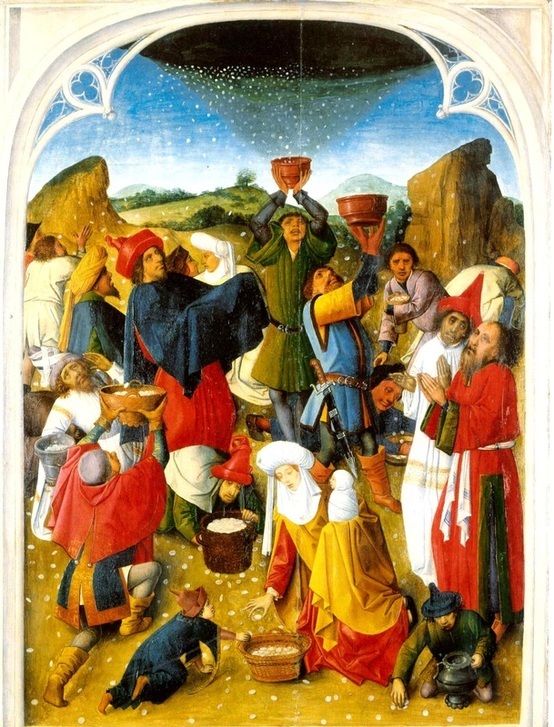 The image of the quiet, hidden coming of dewfall relates to the manna coming quietly from Heaven to the earth, and also the quiet, hidden coming of Jesus at the incarnation, when Jesus was conceived and became man. 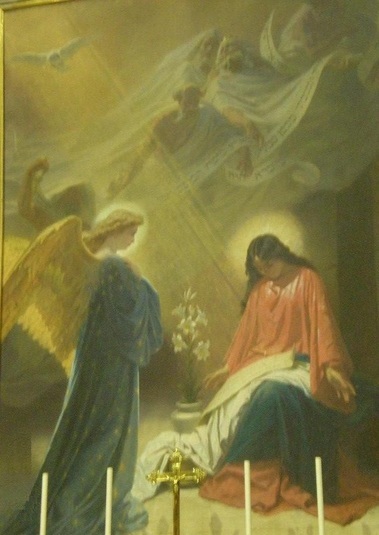 When Mary asked how she would have a child even though she did not have physical relations with a man, the angel told her, “the Holy Spirit will come upon you, and the power of the Most High will overshadow you” (Luke 1:35). Quietly, mysteriously, and with world-changing power, the Holy Spirit simply “overshadowed” Mary, and by that Jesus became man and quietly grew in Mary’s womb. The incarnation is a reminder of a mystery at the beginning of creation. That mystery is how the Holy Spirit quietly, yet powerfully, changes everything He fills. The first mention of this is in the first sentence in the Bible: "and the earth was without form or shape, with darkness over the abyss and a mighty wind sweeping over the waters. Then God said: 'Let there be light, and there was light' (Genesis 1:1-3). The wind symbolizes the Holy Spirit. And suddenly there came from the sky a noise like a strong driving wind, and it filled the entire house in which they were. Then there appeared to them tongues as of fire, which parted and came to rest on each one of them. And they were all filled with the Holy Spirit and began to speak in different tongues, as the Spirit enabled them to proclaim (Acts 2:2-4). Jesus told them to expect things to change when the Holy Spirit came. He said, "... in a few days you will be baptized with the Holy Spirit. ... you will receive power when the Holy Spirit comes upon you, and you will be my witnesses in Jerusalem, throughout Judea and Samaria, and to the ends of the earth” (Acts 1:5, 8). In the Bible, God shows us that the Holy Spirit is creative, active, quiet, mysterious, sometimes hidden, and yet so powerful that everything changes and God's glorious plan is advanced. 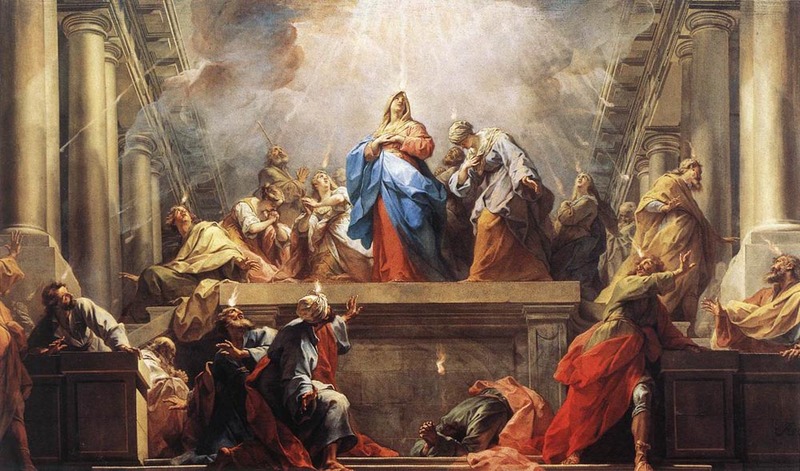 We see the Holy Spirit like this at the dawn of creation, in the manna in the desert for a hungry people going home, the Bread of Heaven in the Eucharist, Jesus becoming incarnate and hidden in Mary's womb, and at the birth of the Church. But the Holy Spirit's work did not end with the birth of the Church. The early Christians received the Holy Spirit who empowered them to tell others about Jesus! The Holy Spirit came upon them, filled them, and they shared the Good News with more people. This process of sharing and experiencing God has repeated itself through the worldwide witness of the Church ever since. Wherever the Holy Spirit comes and is welcomed, He makes people new, and nourishes us on our journey from earth to Heaven. The Holy Spirit works on a large scale, such as the beginning of creation, Israel’s journey to the Promised Land, the incarnation of Jesus, the birth of the Church, and the Eucharist. But God does not only care about the world as a whole; He cares about every individual. He cares about you, and wants to work in your life too. God wants to speak to you, heart-to-heart. God wants you to truly believe that He loves you. The Trinity works together; God the Father, Son, and Holy Spirit: "God sent the Spirit of his Son into our hearts, crying out, 'Abba, Father!'" (Galatians 4:6). God wants to tell you, "you are no longer a slave but a child, and if a child then also an heir, through God" (Galatians 4:7). We need to ask the Holy Spirit to come to our hearts and saturate them like the dew so we can strongly believe and experience the freedom those words teach about. "God proves his love for us in that while we were still sinners Christ died for us." (Romans 5:8) "So whoever is in Christ is a new creation: the old things have passed away; behold, new things have come" (2 Corinthians 5:17). How Does the Holy Spirit Come To Us Like the Dewfall? It is true that the Holy Spirit can come like a "mighty wind" with explosions of light, glory, power, and visible miracles. But He also comes to the interior of your heart like the dew: quietly, gradually, and surprisingly -- until after a while of friendship with the Holy Spirit, you are soaked with God’s love like dew on the grass. Everything is different. Like a well-nourished tree, you produce the "fruits of the spirit:" love, joy, peace, patience, kindness, generosity, faithfulness, gentleness, self-control (Galatians 5:22-23). When He comes and fills you, you will experience what the Second Vatican Council taught when it said that Jesus, "sent the Holy Spirit upon all men that He might move them inwardly to love God with their whole heart and their whole soul, with all their mind and all their strength and that they might love each other as Christ loves them." The Council further taught that this is part of God's call "to the fullness of the Christian life and to the perfection of charity." This is God’s desire for everyone! (Vatican II, Lumen Gentium, section 5). Do not worry, you don't do this alone. The Holy Spirit works miracles at the beginning of creation, the beginning of the Church, and He will work a miracle in you if you ask, "A clean heart create for me, God; renew within me a steadfast spirit" (Psalm 51:12). When Does the Holy Spirit Come? The Holy Spirit can come to you any time, anywhere. It helps to set aside times when you can quiet yourself and simply listen. Listen to Him speaking in the Bible and in the Liturgy. Listen to Him speaking to you through the priest in Confession. Listen to Him speaking to you in prayer. Listen when receiving Jesus in Holy Communion, and when visiting Jesus in the Blessed Sacrament. Just being with God is a powerful experience! Let God's presence touch you, surround you, fill you, and transform you. Let Him speak a language of presence that communicates love directly from His heart to yours; or you can even encounter Him wordlessly. Because He lives in you, let the Holy Spirit make you grow in holiness; this is a great gift He longs to give you.